rom the makers of Hinterland comes “a compelling blend of police procedural, serial-killer thriller, and dark mystery” (DigitalSpy.com) set in the beautiful but foreboding mountains of northern Wales. After years away from her isolated hometown, DI Cadi John (Sian Reese-Williams, Requiem, Emmerdale) returns to help her sisters care for their ailing father. Paired with the capable but overloaded DS Owen Vaughan (Sion Alun Davies, 35 Diwrnod), she soon begins investigating a young woman’s suspicious drowning. With bruises on the victim indicating that she was shackled before her death, Cadi realizes that someone is abducting women and holding them captive. When another girl goes missing, the detectives rush to apprehend the culprit before she becomes his next casualty. Through interweaving narratives, this Welsh noir exposes the brutal secrets that lie beneath the surface of small-town life. 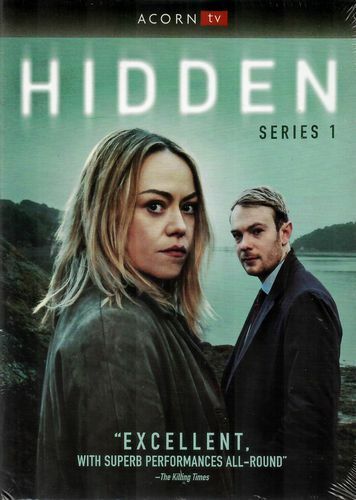 “A sharp twist on your typical crime thriller” (DigitalSpy.com), Hidden also stars Rhodri Meilir (My Family), Gwyneth Keyworth (Doctor Thorne, Case Histories), Gillian Elisa (Stella, A Mind to Kill), and Ian Saynor (Doctor Who).